The Faculty announced its new York Science Scholars program, which will offer $10,000 worth of awards and research placements to as many as 25 first-year students for the fall of 2018. 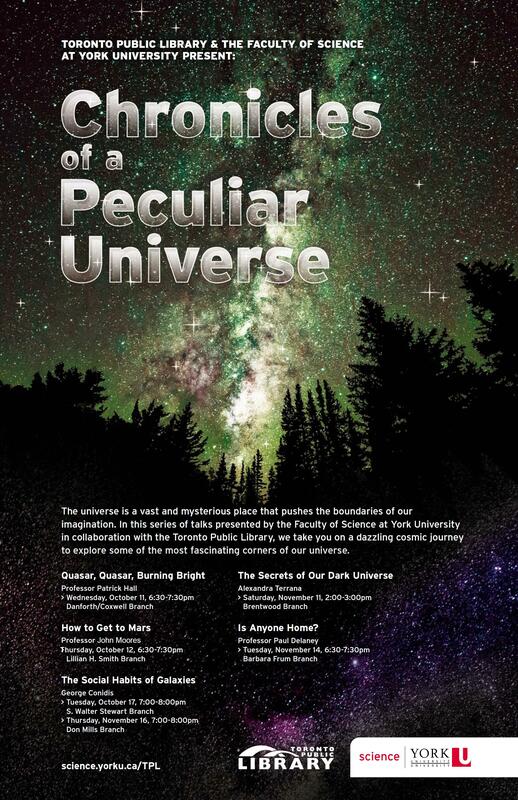 Our public lectures series at the Toronto Public Library, Chronicles of a Peculiar Universe, wrapped up in November. Nearly 200 people attended the talks, which were presented by Patrick Hall (Physics & Astronomy), John Moores (Lassonde), PhD student George Conidis (Physics & Astronomy), recent PhD graduate Alexandra Terrana (Physics & Astronomy) and Paul Delaney (Physics & Astronomy). Thomas Baumgartner (Chemistry), Canada Research Chair in Sustainable Organomain Group Materials (Tier 1). Raymond Kwong (Biology), Canada Research Chair in Environmental Toxicology (Tier 2). Christopher Caputo (Chemistry), Canada Research Chair in Metal-Free Materials for Catalysis (Tier 2). Two dozen Faculty of Science professors received more than $3 million in NSERC Discovery Grants. A story in yFile highlights the success and the recipients. Yet again, 100% of newly appointed Science faculty secured Discovery grants. Sapna Sharma and Dawn Bazely (Biology) attended the 2017 United Nations Climate Change Conference in Germany as accredited observers. Amy Wu (Math & Stats) presented “Multiple change-point detection: Some recent developments and their applications” as a keynote speaker at the 2017 Annual Conference for Science Atlantic Mathematics, Statistics and Computer Science. Dean Ray Jayawardhana presented “Getting to Know Alien Worlds: Characterizing Exoplanets from the Ground and from Space” as the inaugural Oxford Network for Planets in the Universe Distinguished Lecture at the University of Oxford, and also spoke about “Strange New Worlds: Searching for Alien Planets and Life Beyond” at the Rhodes House at Oxford. Marko Horbatsch (Physics and Astronomy) presented a colloquium at the University of New Brunswick about his theoretical work with Eric Hessels (Physics and Astronomy) on the proton charge radius problem. Trueman MacHenry (Mathematics & Statistics) was invited to present a talk at Shandong Normal University in Shandong, China. Hélène Mialet (Science & Technology Studies) was invited to present “Experiencing the world through the nose of a dog: An ethnographic Study of a Strange Ethnographer” at Cornell University. Walter Tholen (Mathematics & Statistics) received an invitation for a one-month Visiting Professorship during May of 2018 at the Universite’ Catholique de Louvain in Belgium. He also received an invitation to present the keynote talk at the Workshop on Categorical Algebra to be held in Italy in May 2018. 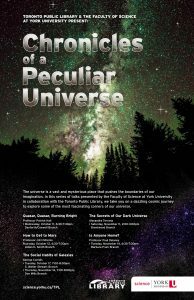 Paul Delaney (Physics & Astronomy) presented “The Ringed Planet Saturn: The Voyage of Cassini” at the Royal Astronomical Society of Canada Toronto Centre. Bridget Stutchbury (Biology) and co-authors found that songbirds exposed to widely used insecticides during migration pit stops on farmland could lose significant body weight and became disoriented. Read the press release. Bridget Stutchbury (Biology) and her innovative use of geolocators to study songbird migration was highlighted in The Atlantic. Sapna Sharma and Dawn Bazely (Biology) co-authored How citizens are fighting climate change on the global stage in The Conversation. Research by Hélène Mialet (Science & Technology Studies), PhD student Alex Filazzola (Biology, supervised by Chris Lortie), and Sapna Sharma (Biology) and her former student Thomas Van Zuiden was highlighted in the fall edition of The York University Magazine. Paul Delaney (Physics & Astronomy) spoke to CTV News, AM640, and Sirius XM about Moon occultations, the Leonid meteor shower, Venus and Jupiter conjunction, the Ross 128b exoplanet and the interstellar asteroid ‘Oumuamua. He also spoke to The Star about how someone can go about determining if they have found a fallen meteorite. Dec 6: Science Holiday Party, at the Underground, 2-4 pm. Dec 6: Physics Teacher’s Night, 320 Bethune (Paul A. Delaney Gallery), 5:30-7:30 pm.